Last week was exam week for the Fall of the Roman Republic. With Open Universities, a non-invigilated exam will be open, the questions available, for several days or a week, and you submit your answers in a Word document by the due date. Last week was also the week that Aidan returned to work after a five week break. Despite needing to work, being sick, and wanting to do his own study (Aidan’s just starting with Open Uni too), he was willing and able to take the kids out a few times and give me plenty of time to get my exam done, distraction-free. I am so grateful; I would never have gotten the thing done if I’d had the kids underfoot the whole time. Aidan’s help and support is, as always, invaluable. So it’s all done, submitted, and now I move on to my next subject: Human Evolution and Diversity. Evelyn adores grapes. This is a sequence of photos I took this afternoon, starting with grumpy grapeless, and proceeding through the receipt, appreciation, and consumption of grape. She is also getting very tall. It turns out she can now reach the fruit bowl and help herself to grapes! Glad as I am that she’s eating fruit, too many grapes is a good way to give yourself the runs, so I had to move them out of her reach. For five weeks, Aidan was on leave from work, at home with us. But as of yesterday, he’s back with his nose to the grindstone, leaving me home with the kids again. I was kind of dreading it; I’d gotten used to having his constant assistance around the house. He is, and always has been, an excellent housekeeper and father. So I thought being back to normality would be a pain. But, for the last two days, I find myself coping extraordinarily well. I find that I do more, and more willingly, when I’m alone. I’ve washed dishes and clothes, I’ve taken the kids out, I’ve been shopping, I’ve baked and cooked, I’ve been more active and involved with the kids. And I’ve enjoyed it. Who knows how long it might last, but for the moment I like being a proper housewife again, doing it all myself. I’m even keeping on top of my studies – and it’s exam week for The Fall of the Roman Republic. The only thing I’ve gotten worse at is drinking my tea. Once again, cups are left going cold, forgotten, as I’m distracted by something else I need to do! Evelyn is nearly eleven months old now. I can’t believe it, that’s nearly a year! So here’s an update of how she is growing. She is a champion speed-crawler, I am always amazed at how fast she goes. She’s also cruising around very effectively on her feet, using furniture and walls and people and whatever else she can reach. 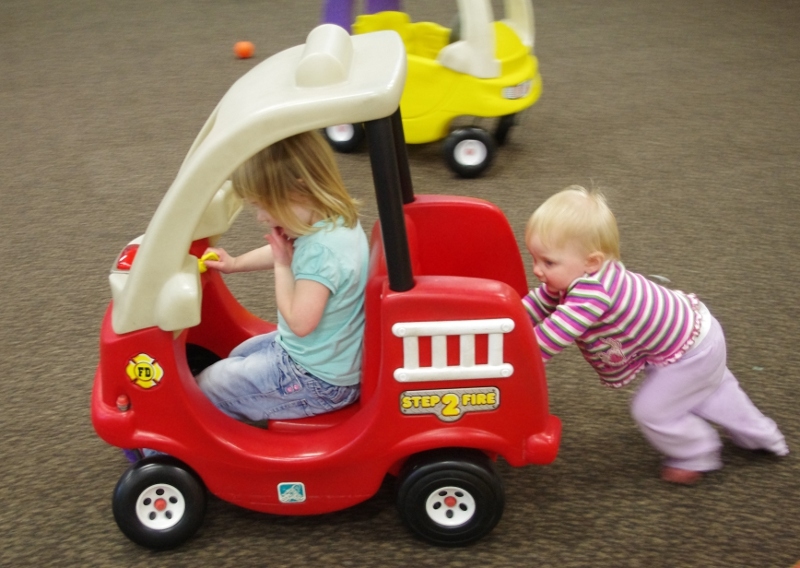 She’s got a walker – an upright toy with wheels and a handle – and she races around the house behind that. She’s pictured here pushing Elspeth around. Evelyn is also beginning to sleep really well. I’ve got her down to one nap during the day, and that has helped her sleep through the night. We haven’t had a ridiculous o’clock wake up for about a week now, so I’m confident in saying that’s it. She is still eating wonderfully. 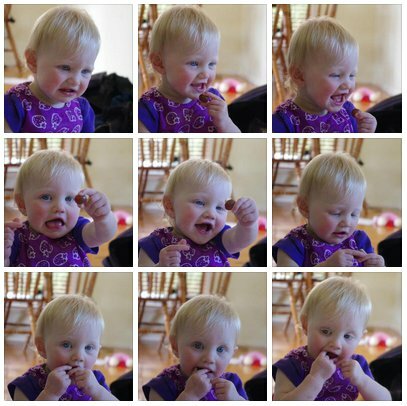 She eats anything, everything – except egg. She only has two teeth, but it’s amazing what she can do with them! She was managing big chunks of coconut last night. She is also becoming really communicative; even though her vocalisations are still mostly ‘ba’ and ‘ga’ and ‘da’ and so on, she can make it very clear when she wants something. For instance, she points at food she wants. She headbutts me in the mouth when she wants a kiss. She screams when she wants attention – but stops and entertains herself if I ignore her! She and Elspeth are getting much better at playing together. I hear more laughs than screams now as they frolic. I still think Elspeth is too rough with her, but as long as Evelyn is laughing, I figure she doesn’t mind. All in all, I’m pleased with how she’s going. I think she’s going to be another smart cookie, like her big sister, so I’m in for a hell of a time when she starts talking! Pre-heat oven to 220 degrees Celsius. Mix flour, sugar, and salt in a large bowl. Mix in the butter; I found rubbing it to work best. On a lightly floured surface, roll or press the dough until it’s about 2mm thick all over. Use a cookie cutter or the top of a shot glass or whatever you fancy to cut out your preferred shape of cracker. 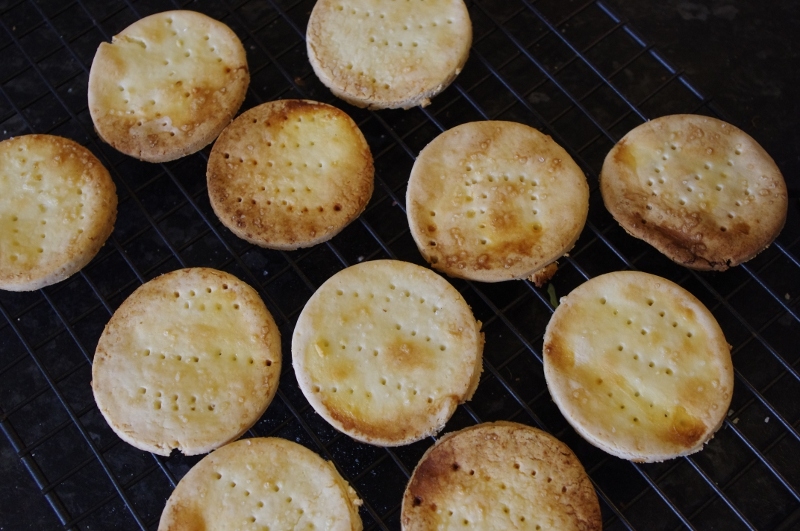 Place the crackers onto a lightly greased baking tray. Prick the tops with a fork a few times. Brush each one lightly with milk, and then sprinkle with salt (optional, but yummy). Bake for 15-20 minutes, or until golden brown. I cooked mine for a little bit too long, and they ended up quite hard, but they were still quite nice! So I’d recommend closer to 15 minutes than 20. 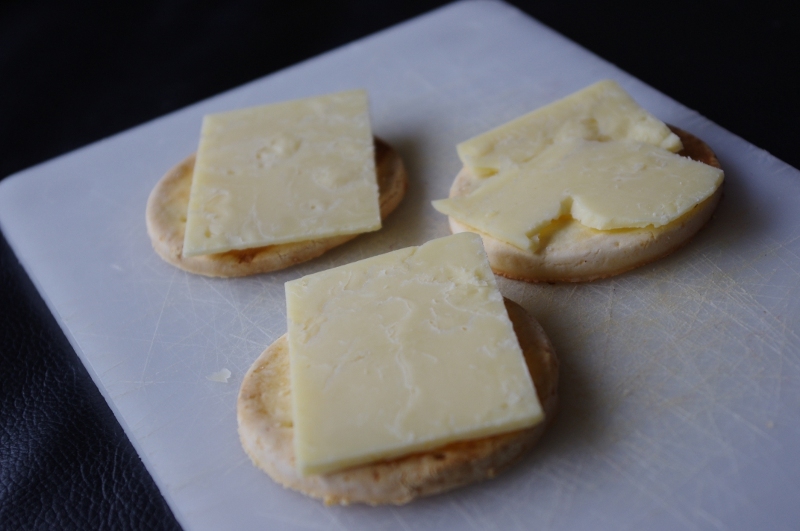 This recipe was adapted from Sue Shepherd’s ‘Irresistibles for the Irritable’ cookbook. Pre-heat oven to 180 degrees Celsius. Rub butter and flour together until the mixture resembles breadcrumbs. Add salt and pepper, mix well. Add egg and water, combine to form a dough, knead lightly. Put dough between two sheets of baking paper and roll out to about 2mm thick. 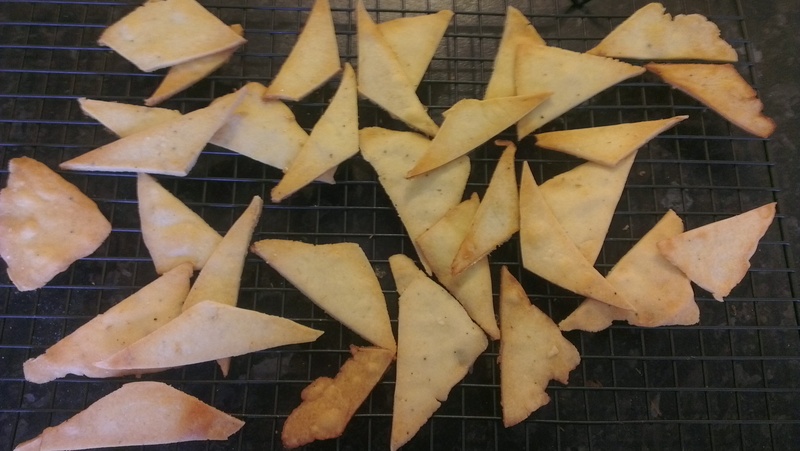 Cut the flattened dough into triangles (or whatever) and place them on greased baking trays – it took two trays, for me. Brush them lightly with milk. Bake for 15 minutes or until golden. I am on my phone at mum and dad’s place. Evelyn is on Aidan’s lap, mum is reading to Elspeth, and my dad has the cat. We are all happily occupied!